Hooded Crow. 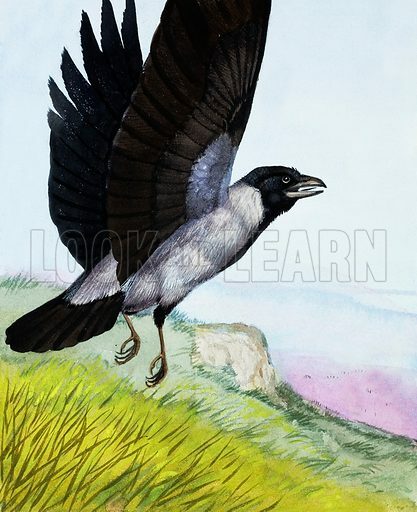 The Hooded Crow has a black head, but grey back and underparts. It eats anything, from seeds to small animals. Its nest is high up in a tall tree and the bird often returns to it for a number of years. Original artwork for illustration on p4 of Once Upon a Time issue no 48. Lent for scanning by the Illustration Art Gallery. Available worldwide for immediate download up to 3,609 x 4,433 pixels.